Can You Deal with 53 Runner’s Commandments? I finally found one for running enthusiasts. However, I’d like to use them as guides instead or suggestions. I love #3 – Don’t make running your life but part of your life. Remember the balanced life? #49 – Never confuse the Ben-Gay tube with the toothpaste tube. (that’s for me- funny but true). 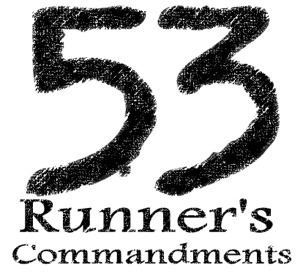 Thanks Kassy for sharing the 53 Runner’s Commandements. Now, runners which one is your favorite?